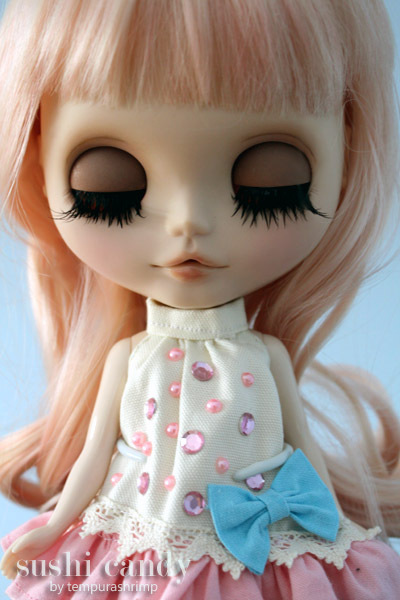 I’ve posted in previous entries that I would love to start customizing Blythes. I’m making a to-do list and trying to figure out what exactly I need to do what I want to do. I’ll be using Christmas money to buy the base doll for starters. That’s about it. I hope to this girl customized by spring. She will be a blonde or a redhead with short hair. I haven’t decided yet. I want to carve her lips and do her faceup myself. Right now, it’s just in the planning stage. I know I’ll be taking my time and I’m in no rush. This project will be in the backburner. § 4 Responses to Planning for my personal Blythe Custom"
I’m excited to see what you come up with. I’m in the saving stages from my own blythe custom. There is no way I want to try that on Bijoux since she’s an SBL type. 😡 I’ve got a Lagoona Monster High doll to do something fun with soon. You are currently reading Planning for my personal Blythe Custom at Sushi Candy.